Nerds are the result of being brainwashed and genetically modified by AI machines created by mad scientists. In some rare cases, like the ones of Neo and Peter Parker, a nerd becomes a superhero. Nerds are a subspecies of Geeks with a lower IQ rating, and are smaller, more frail, and more acne-covered than geeks. Obviously, some of this is dead on (like that part about nerds vs. geeks ;) but the rest was just downright weird and hilarious. Turns out Uncyclopedia is a wiki full of made up facts presented with a distinctly Wikipedia sort of look and feel. The content is generally humourous or nonsensical, and like Wikipedia, is written and curated by volunteers. Who spend their time making this stuff up! It's one thing to think that there are armies of wikipedia editors validating content, owning pages, moderating discussions. But then it's a whole other thing to think that there are similar armies doing the exactly the same thing about completely fictional content! To the tune of 30,000 articles with over 5.5Million edits, according to the stats page. 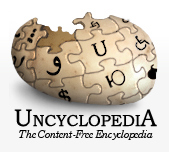 This page is considered an ignorable policy on Uncyclopedia. It has wide acceptance among editors and is considered a standard that everyone should follow, unless they don't want to, in which case they are free to ignore it, in which case nobody will care. Please make use of the standing on one knee position to propose to this policy. Parody sites are a lot of fun, to be sure but don't you usually picture some doode sitting in his mother's basement giggling to himself and updating pages in the dark? Not an army of active doodes and doodettes doing the same 5.5Million times, all across the world? It's amazing what people will find to keep themselves busy (says the grrl blogging to herself 5 times a week). They put so much work into it, you should check it out. Hell, you can even contribute; just make something up! Did you know about Uncyclopedia? Are you a contributor? Are you aware of any other similar parody sites? Do share!